We have finally got round to stocking some of everyone’s favourite former-soapstar-now-cheesemaker’s cheese. The Saddleworth Cheese Co (that’s Sean Wilson, or Martin from Corrie, as I’m sure he’s not at all fed up of being called) produce the trinity of Lancashire cheeses (crumby, creamy & tasty), but as we’re pretty big fans of Mrs Kirkham’s, we’ve instead plumped for the ‘other’ option – his blue cheese offering. 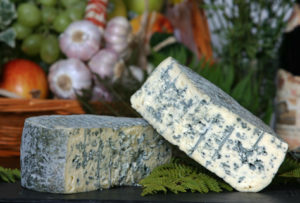 Smelly Ha’peth is a medium-soft blue. Made to his own recipe, Sean acknowledges Dovedale in its development. However Smelly Ha’peth has a more firm texture, and is less salty, with a nuttier flavour. Thanks to Vicki for her recommendation!